Start Something, the CED Blog: Last Day to Sign-up for the Downtown Raleigh Alliance's Annual Meeting! 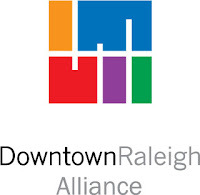 Last Day to Sign-up for the Downtown Raleigh Alliance's Annual Meeting! Don't miss your chance to celebrate downtown. Click here for online registration (MasterCard or Visa only). You are cordially invited to the DOWNTOWN RALEIGH ALLIANCE 2012 Annual Meeting and Downtown Achievement Awards Ceremony celebrating individuals, businesses, and organizations whose contributions are making a significant impact on the revitalization of the city center. Driven by the tagline, "Destination Downtown: Right on Track," the Alliance has secured guest speaker, Roger Brooks, President of Destination Development International, to reveal the key ingredients of an outstanding destination. Mr. Brooks is well known for energizing communities into action-providing ideas they can implement today to make a difference tomorrow. Join us for an entertaining evening as we celebrate the current successes and future opportunities in downtown Raleigh. To view a clip of Roger's "best moments" video, click here. This year, the DRA really wants to get more downtown residents engaged in its efforts. After all, they are the lifeblood of any strong downtown. That's why we're offering tickets to downtown residents at a deeply discounted price. So tell your friends, get a group together, and come out for a great evening. We think you'll be glad you did. For more information, contact Erin Heiderman at erinheiderman@downtownraleigh.org or 919.821.6986. In an effort to reduce your carbon footprint, we encourage all attendees to RSVP by using the online registration and payment form. The deadline for registration is Thursday, February 9. Since there are no printed tickets for this event, please be sure to provide the first and last names and company names of all attendees on the online form. If you need an alternative payment option, please contact Erin Heiderman at erinheiderman@downtownraleigh.org or 919.821.6986.